GENEVA — Cornell Food Venture Center Director Olga Padilla-Zakour was never the shy one when it came to expressing what her facility needed to do its job, said former State Sen. Mike Nozzolio, a longtime supporter of the work at Cornell AgriTech. “Olga’s Kitchen,” as Nozzolio called it Thursday afternoon during a ceremony celebrating the 30th anniversary of the Cornell Food Venture Center, needed some renovations. 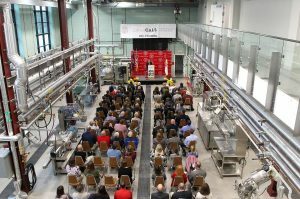 Nozzolio, along with a host of other officials from the state, Cornell and the food industry, celebrated renovations to the Food Venture Center’s Pilot Plant, which features some of the highest tech gizmos available in food processing and preservation research and development.